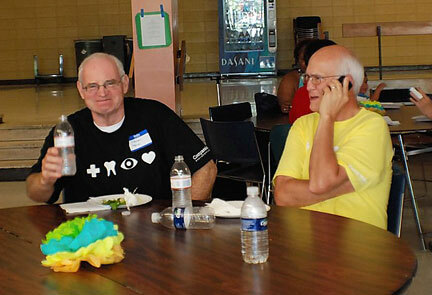 Around 600 guests and volunteers came to Roosevelt High School for the Compassion North Portland Event on August 4. The Vancouver/Portland branch joined with 25 churches and organizations on Saturday, August 4, in an ecumenical effort to provide free medical care to North Portland-area residents. 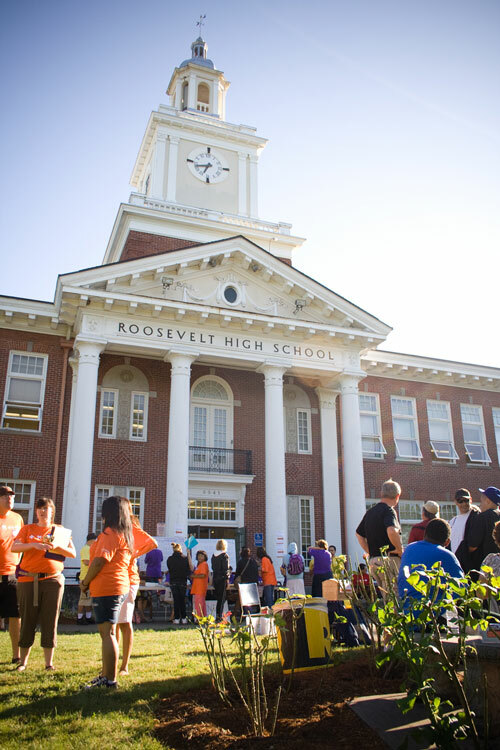 Organizers estimate that more than 300 guests and 300 volunteers came to Roosevelt High School for the Compassion North Portland event. Some guests arrived at 3:30 a.m. to receive basic dental exams, tooth extractions, eye exams, routine physicals—and even haircuts. Luke Glover (Vancouver/Portland), who led the parking and security team, said he found a line of people already waiting when he arrived at 5:45 a.m. The temperature soared to 100 degrees during the day, but many waited patiently to set up appointments with dental, general medical or optical specialists and filled out paperwork during their waits to speed things along. Carole Richardson (left) served on the child care team. Photo: Betsy Lance. Six vans organized by Fred Dang (Vancouver/Portland) transported guests to off-site dental appointments. (Other appointments were held at the school.) Mike Freeman (Vancouver/Portland) produced promotional materials for use before and after the event, and joined the prayer team, along with several members of his men’s group. They interceded for the event regularly beforehand, and sat in various public spots that day, praying with anyone who asked and praying for prayer requests that guests had submitted in writing. Ann Martinez (Vancouver/Portland) recruited and organized 20 people to serve as translators, primarily for Hispanic guests. “I was struck by the humility of all the volunteers I met. They were willing to work hard and dove right in,” she said. After their appointments, guests filled out forms and went through exit interviews. Organizers are collating the information and will be distributing names of willing guests to some of the churches and other groups for follow-up. Charlie asked for 15 names for the branch. “We’ll see whom the Lord brings to us,” he says. Bring 'em in, Lord! The Lord is doing great (and new) things to build his Kingdom. Come Lord. Well done. Good and faithful servants. That is so exciting! Great work everyone. Praise God! This is amazing! Praise God for all your love and hard work! What a wonderful event. As I read I thought of how proud the Lord was of his people serving his creation and showing his love to all. I'm so impressed that this was a holistic healing event that incorporated the best in human problem solving skills, organizational skills, medical skills, caring skills, and prayer skills. I think this is a model of how the Lord wants us to build the kingdom of God, using every available gift He has given us humans. I see you building a new "Portlandia", the truth rather than the TV, a city of compassion. Way to go, Vancover/Portland! We are proud of you. Sounds like this event is the start of many new relationships in the Portland/Vancouver area. Very interested to see how the follow-up with both guests and other organizers will go in the months ahead. We should do this in NOVA. Praise God for love in action. Great job everyone in the Portland Branch. It is a joy to hear about it! I am so blessed by all the work you have done. Blessed be God. The People of Praise will be known by so many more in the area thanks to you all. What a marvelously creative idea to serve God's people, network with other Christians and provide an oppportunity for so many Branch members to be apart of an outreach together! I hope this model for building the Kingdom is able to be used in more branches across the People of Praise. God bless all you brothers and sisters in Vancouver/Portland. Just the way life in the Kingdom should be lived. Way to go POVA. This sounds like quite the missional enterprise - Charlie's 3Ps in action! May God bless your remarkable efforts, serving as Christ. God bless all you folks for sharing God's love and bringing His kingdom to your neighbors in such a concrete and visible way. You are an inspiration to us all. Sounds like the Lord's work to me! Thank you for hearing God's word and acting on it. Your kindness, generosity and great efforts will bear fruit. God is so good! Praise the Lord for the opportunity! May God produce much fruit for your generous work you've done! What a beautiful thing it is to see the way so many are acting as Jesus' hands and feet for his needy ones. May God bless you as you continue in his work. What a wonderful outreach! Anxious to hear how the Lord continues to work through this. YES! What an incredible banning together of neighbors, friends, christians, etc to be a witness to the city of Portland!! Rebuilding, renewing, and restoring the city and people's faith in each other! You are amazing! Press on good and faithful servants! Thanks to our brothers and sisters in Vancouver-Portland for representing the People of Praise so well through Compassion Connect! Great way to serve the Lord's people. Is there some way you can send out the planning of this event so that others could go to churches and try to do the same in their city? This is what has been done for other poor countries - now it seems a good time to bring it home to our needy people here. What a wonderful way to love God's people! The healing ministry has many parts to it.Health care to promote life and its' issues was on display here.Keep it up! Apparently, there is still hope for the blind.Especially, the spiritually blind in high places.